It’s a rare frilled shark, and if you’ve never seen one before, you won’t ever forget what they look like. . . These sharks have a long, slim body – almost like an eel – and scientists know little about them in terms of their biology and environment because they live at such great depths in the Atlantic ocean. 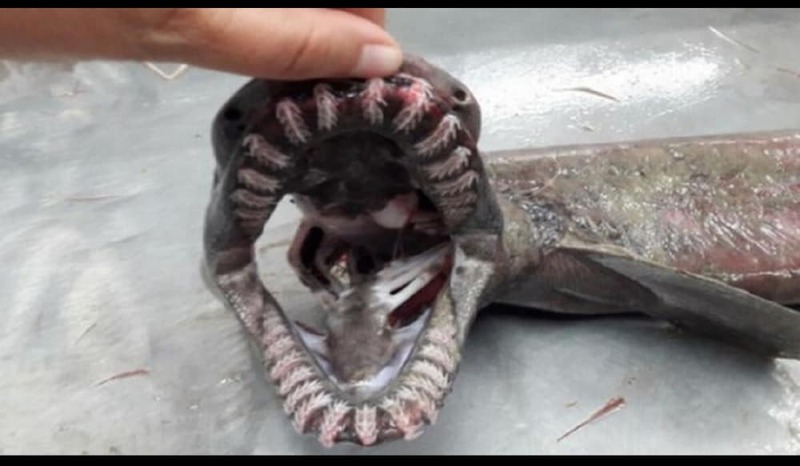 “A frilled shark, a species that is often termed a ‘living fossil’ because of several ‘primitive’ features that have survived for millions of years, has been captured off the coast of Portugal’s Algarve region, the country’s meteorological and sea institute has announced. The animal was a male, 1.5 metres in length, and was fished in August at a depth of 700 metres, the Portuguese Institute for the Sea and the Atmosphere (IPMA) said in a statement released on Monday. The frilled shark is found across the Atlantic, including off the coast of Norway and in the waters of Scotland, Galicia in Spain, the Azores, Madeira and the Canary Islands, as well as in the Indian and Pacific Oceans, namely off Japan, Australia and New Zealand. It is rarely caught because it lives at great depths.